Every year around this time, I start to get a lot of questions about fall offers that Disney may release. These questions usually circle around two words- FREE DINING. Let’s address these questions here to get a jump on what may happen. 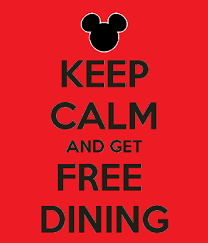 Free dining is usually released in April for dates late August through December. Not all dates are included. Every year the dates get more limited. IF and only IF free dining is released you will not get it automatically. You must be at a qualifying resort that has availability. If you are willing to change dates or resorts your chances increase. Free dining is not always the best offer. If you have a stay at a value or moderate resort with base tickets now, adding free dining means you get the quick service meal plan free and will pay to upgrade to the regular plan and you will pay to add on the park hopper option. I always make sure that my clients have the deal that saves them the most money. Don’t let the word FREE fool you. If Free dining releases you can bet that I will be working round the clock to get you what you need and want to the best of my ability. It is easier for me to help you as an existing client, so if you know you want to travel, lets get you booked today! Your $200 deposit is refundable, so if you decide you cannot travel you haven’t anything to lose. All new bookings of $3000 or more for Fall of 2018 will receive a $25 gift card as my gift to you. Email me today to find out more! If you would like to work with me on your fall reservation please email Jess@pixievacations.com for a quote today! This entry was posted in Deals and Discounts and tagged Free dining, Walt Disney World. Bookmark the permalink.